The world is developing at warp speed. Every single day, more research is being done on developing the newest technologies that will make reaching out to the rest of the world. In order to keep up with this fast paced world, we need to not only be aware of the newest technologies, but also be savvy with them. After all, this world runs on the policy of survival of the fittest. And in order to survive, you have to be up to date with the latest innovations. Everyone wants to put themselves out there in the world. – to be noticed, to be acknowledged, to be sought after. From the oldest innovations to one that bring us closer to people who are physically far away from us- the telephone, to the invention of the portable mobile phones, the invention of Internet based mediums to reach out beyond geographic boundaries, such as emails, voice calls over the internet, video calls, etc. In this article, you will learn all about Webinars, and how you can successfully run your very own Webinar. The first topic here is, What is a Webinar? Webinar is an amalgamation of the two words – Web-Based Seminar. It is a lecture, presentation, workshop or seminar conducted over the Web. It is an interactive session, where viewers can interact, ask questions, and show their reactions to the seminar or lecture being conducted by the host. There are various webinar softwares which can be used to conduct a Webinar, such as Google Hangouts webinars, Webinars OnAir, Skype, Adobe Connect, etc. Most often these are free Webinars, but they can also be chargeable, depending on the host of the Webinar. This is a very interesting concept which is gaining popularity fast, and if you want to know how you can run your very first Webinar, here are some tips and tricks which can help you. How to Run Your First Webinar? Should you produce a Webinar? One of the fundamental questions you must ask yourself before stepping into the world of hosting Webinars, is to find out if your content is worth it? The reason for this is because, there are thousands of extremely boring Webinars out there, and these people might have put in all their time and effort into producing their Webinars, but their content was just not interesting enough to capture the audience. This is a common hindrance you might face, so first of all, start off with adequate market research and surveys to find out what kind of audience you want to capture, what your audience is interested in, and how to target this particular market. 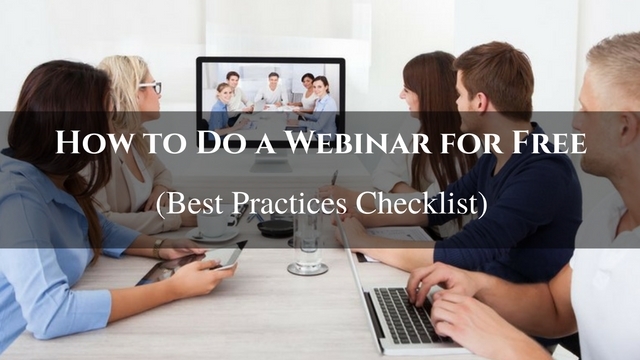 If done correctly, webinars can be extremely efficient in targeting audience, teaching, and also making sales. Most people are too busy nowadays to waste their free time watching something which is boring, or of no use to them. If you want to capture your audience, you have to talk about a topic which is of interest to them. Choosing an appropriate topic is one of the most important as well as the hardest steps of creating your own Webinar. Do your market research well- go through comments, ask your audience what topics are of interest to them, target your audience. A detailed examination of a new or ‘niche’ topic from a different angle. A simple but thorough “How To” tutorial. These tutorials are gaining popularity fast, and are one of the most searched for topics over the web. A panel discussion of a news based issue in your industry. Make sure you choose a topic which you have researched over from each and every angle. Since Webinars are interactive, your audience might have queries or questions, and if you are not able to deliver, you will lose your audience. Now that you have your content ready and are rearing to go, spend some time planning on the design of your content. This will be the format in which you will deliver your seminar to your audience. Always keep in mind, this is an interactive session, not a monologue. You have to design your speech in such a way that you give yourself the time to respond to your audience, and make them feel an active part of the Webinar. When ending your webinar, don’t forget to ask them to like your facebook page, or sign up for your email list to get the schedule for your upcoming Webinars. In order to run a Webinar, you must know your audience. Target a specific group of audience for specific topics of interest. Pet owners would be more interested in Webinars conducted about how to properly groom, or train your pets. On the other hand, those who are interested in say, DIY projects or tutorials, will again be a specific set of audience. Know your audience and tailor your Webinar content accordingly. An important point to consider when hosting your own webinar is to remember that your target audience is not necessarily on the same time zone as you. Since webinars are real-time, i.e you are broadcasting live, consider your audiences time zone and schedule your webinars appropriately. Be sure to specify the time of your Webinar in respect to the different time zones, so that no one misses out on your Webinar. You will be responsible for your own marketing campaign when you are running your Webinar. Send emails. Reminders, Facebook posts, Twitter, whatever social media updates you think might be relevant, to spread the message. For added effect, specify the topic name and time of your Webinar so that it absolutely doesn’t miss their eye and stays in their minds. As it has already been said, in order to be at the top of your game, you have to be in touch with the latest technologies. Be comfortable with the Webinar technologies and software. Your audience will notice if you are new and unsure of what you are doing. You need to show confidence in order to capture the interest and trust of your audience. The next most important topic would be, to choose a specific problem for your topic of discussion. Your ultimate goal in hosting a successful Webinar is to create a sale. Thus, the fundamental principle of hosting a good Webinar should be to take a certain problem, and providing a solution to that problem, by the sale of your product. Now that you have established the problem at hand, offer the audience your solution. This might be by marketing a product, or offering a tutorial on how to solve the problem. Whatever the solution is, the desired outcome should be to create a sale, either of your product or your idea. This should be done in the form of a short lesson, or tutorial, which will establish your credibility in front of your audience. As far as possible, you must try and make your Webinar interactive. This way, your audience doesn’t get the feeling that they are watching a commercial on television. They should be able to clear out all their doubts, and you must be convincing enough in your replies to gain their trust and confidence. Most people who decide to run their own Webinars are under the impression that it is an extremely easy and enjoyable experience. In reality, hosting a best Webinar is almost as difficult as standing up on a real platform and talking to hundreds of people in front of you. No matter how confident you are of yourself, you have to practice and run test Webinars. Hosting a Webinar successfully requires practice and patience, both which you have to do yourself without any external help. The more Webinars you host, the more familiar you will be with the technologies, the tricks by which you can captivate your audience, what to do and what not to do. Host a Webinar for yourself, or for a few chosen audiences, and see how you appear on camera. Try and eliminate the “ Umm” and “ Uh” and “Err”s from your speech as much as possible as it sounds extremely unprofessional and gives an impression that you are unsure of what you are saying. Have someone log into your Webinar, and give an honest feedback on how you performed. Make sure your voice is audible, but you are not being too loud or too soft. Your tone must sound friendly. Many people, in order to deliver a memorized speech perfectly, end up sounding like robots. You don’t have to memorize your speech. Just practice it enough to be able to say it confidently and in a proper flow. While you might be captivating enough to capture the interest of your audience, you might want to prepare some slideshows along with your speech. Visuals always have a greater impact on audiences, so prepare the slides with time, use appropriate colors and pictures, and just have fun with it! Just as important as visuals, is the audio for your Webinar. Test your speakers and microphones. Make sure everything is working and in top condition. Choose a conference room which is soundproof, and free from any external disturbances. You must try and make your Webinar look as professional as possible. Do not rely on the microphone of your laptop or computer. Have an external microphone, as it is possible that your sound quality is extremely poor through the built in microphones, effectively ruining your entire Webinar. When hosting your first Webinar, start off the first 5-10 minutes with a story about yourself. Engage with the audience, make them interested in you. Next, go on to your topic to be discussed. Always remember to interact. Try and develop an emotional connection between you and your audience, so that they keep coming back to your Webinars. Your audiences don’t want to feel like they are once again part of a classroom. Include humour in your webinar presentation, of course, be politically correct and never be offensive. This will drive away your audience for good. Remember that your voice is the connector here. While you want to be engaging and give your audience all the information they need, remember to pause sometimes, ask questions. Make them feel like you are acknowledging their presence. If they did not want to interact, they would have watched videos on other social media, and not taken the time out to join Webinar of yours. So make your audience feel special and wanted. All other forms of social media, Facebook, Skype, Messenger, your phone, everything else should be turned off so you can give your complete attention to the audience. There should be nothing else coming in between you and your audience, except your presentation. Lastly, just remember to be yourself, go with the flow, and have fun with your Webinar. Remember to send reminders to your audiences regarding your upcoming Webinar schedules, and always specify time and date to avoid confusion. The more Webinars you host, the better you will get at them. Running your first Webinar can be extremely nerve wracking, so just enjoy yourself, and your audience will follow.